If you are reading this, first of all thank you for visiting this website. As a Jehovahs Witness April 3rd 2015 is one of the most important nights in the calendar for the year. When the emblems come by you this year what will you be doing? “Since sharing in the bread and wine passed during the Memorial involves all of this, it would obviously be inappropriate for those having an earthly hope to partake”. Watchtower 15th February 2006. Do you have a heavenly hope or an earthly one? You may say that only 144,000 have a heavenly hope, and therefore you are one of the people who will be resurrected on to the earth. Does the bible actually say that only a set number will go to heaven? Are you part of the great crowd? If the answer is yes, then according to scripture you are going to heaven! John’s prophesy talks about a great crowd which is standing before the throne and before the lamb. Where is the throne of God? So the great crowd are standing in front of the throne, and the throne is in heaven. If that is the case then what of these 144,000? Who are these? Is it possible that the 144,000 are actually from the exact tribes John is prophesying about? Why read into this verse any more than what it literally says? What of this number 144,000? Was this not supposed to represent the number of people that would reign in heaven with Christ or which all would be faithful Jehovahs Witnesses? A number of questions arise.. Between the disciples dying and Charles Taze Russell starting the Watchtower organisation did nobody go to heaven? Should not the number of people partaking actually fall instead of rise? In 2005 only 8,524 partook, yet in 2014 14,121 partook why? If the tribes are mentioned in the verse in Revelation, why are the 144,000 not actually from those tribes? Is it possible that this teaching of the Watchtower is actually incorrect? What does the bible actually say about partaking? 2 things here……1) Jesus specifically said to EAT this loaf and DRINK this cup and 2) According to Jehovahs Witness teaching Jesus already returned in 1914, so why do you “keep proclaiming the death of the Lord, until he comes” when you believe he already returned in 1914? 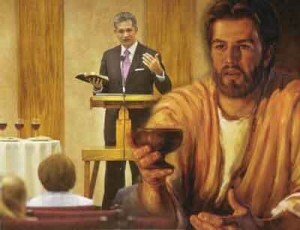 Jesus spoke of how important it was to partake of the bread and wine. Will you follow the words of Jesus or follow the words of the governing body? Did Jesus say only 144,000 Partake? No! Did Jesus say only 144,000 need to be born again? The bible says unless ANYONE is born again, not just 144,000. Are you born again? If you are not then how can you expect to see the kingdom of God?